Today is the feast day of Saint Geminianus, the patron Saint of the small but lovely city of Modena in the Emilia-Romagna region of Italy. Not very much is known about Geminianus, who died in the year 397, (he is not even included in Butler’s Lives of the Saints), but devotion to him flourished in northern Italy; his name was even adopted by the much smaller Tuscan city of San Gimignano about hundred miles away, one of the country’s most popular tourist destinations. 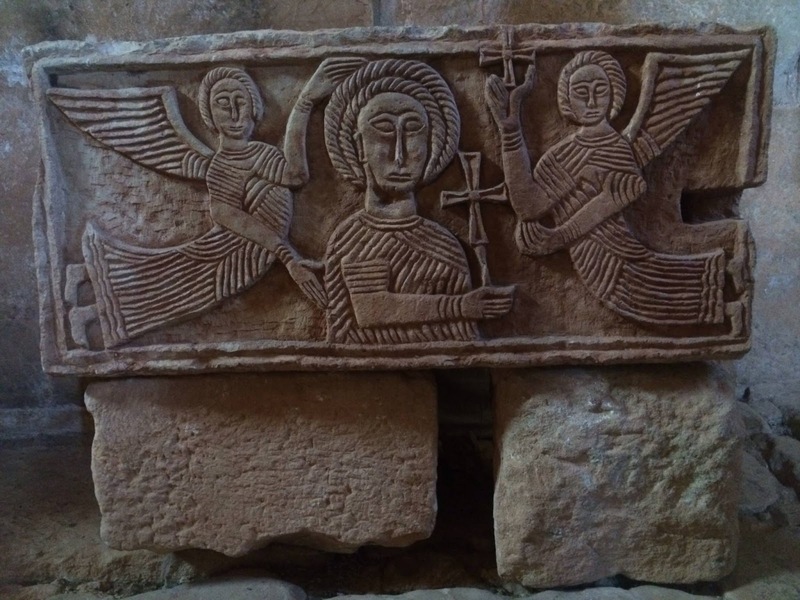 Yesterday, we saw the outside of the church and its famous sculpted panels of stories from Genesis; today we will visit the beautiful Romanesque interior. The cathedral museum preserves this decorated folio for the use of the bishop when he presided over Vespers of the Patronal feast; it contains only the opening verse “Deus, in adjutorium...”, the intonations of the first antiphon, the hymn, and the antiphon of the Magnificat, and the prayer. 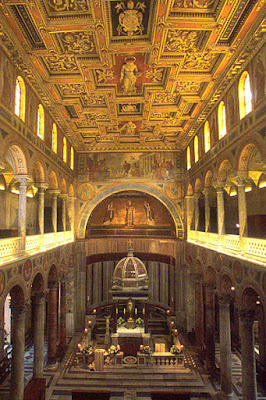 The main sanctuary is considerably elevated above the floor of the nave, accessed by staircases on either side, while the crypt beneath is only a few steps lower. The reliefs on the liturgical pulpit show Christ and the Four Evangelists; those on the balustrade show the Passion of Christ. The Last Supper if for obvious reasons given a prominent place, perhaps in deliberate imitation of the Byzantine custom of representing it on the iconostasis. Note also that the rood screen was never removed. The entrance to the crypt. 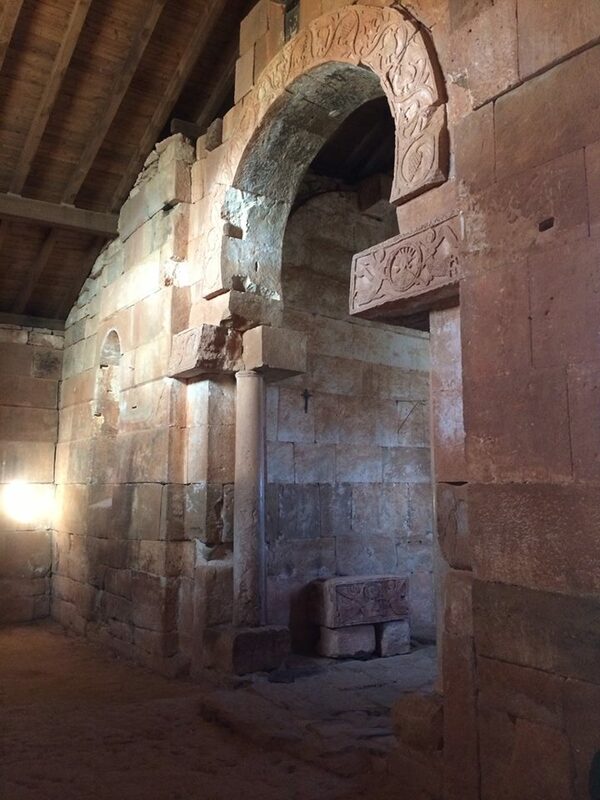 The crypt itself is a small forest of well preserved Romanesque columns and capitals of the 12th century. The sarcophagus which preserves the relics of St Geminianus, made in the late 4th century. 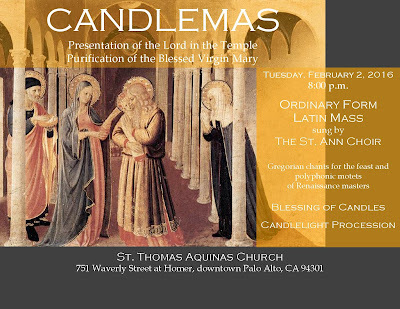 Our next major photopost will be for the feast of Candlemas; please send your photos of the Blessing of Candles, the Procession and the Mass to photopost@newliturgicalmovement.org for inclusion. 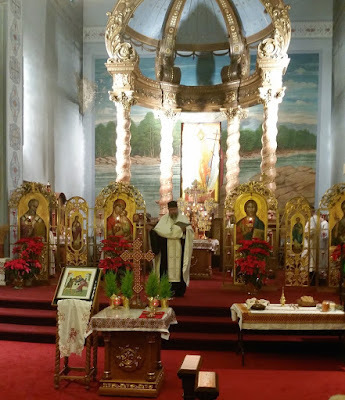 We are always glad to receive photographs of celebrations in either Form of the Roman Rite, or any of the Eastern rites. Please be sure to include the name and location of the church, and always feel free to add any other information you think important. Evangelize through beauty!! 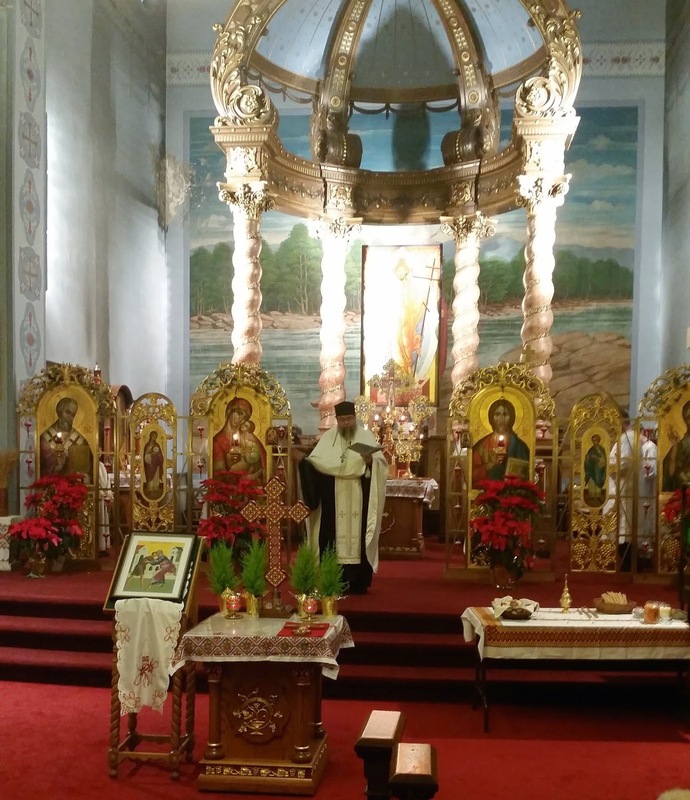 From last year’s Candlemas photopost - Vespers of the Presentation of the Lord at St John the Baptist Ukrainian Catholic Church in Pittsburgh, Pennsylvania. Since the Church traditionally begins to read the book of Genesis in the Divine Office on Septuagesima Sunday, I thought I would take the opportunity to end the week with some pictures of one of my favorite churches in Italy, the Romanesque cathedral of Modena. The façade, constructed at the very beginning of the 12th century, is decorated with four panels by a sculptor named Wiligelmo, representing stories of the Creation, the Fall of Man, and the Flood. These stories are placed on the outside of the church to remind us of our fallen condition and consequent removal from the presence of God, a presence which for Christians is regained inside the Church. The plant and animal motifs inside the church and on its doors show us where the garden of Paradise may now truly be found. Tomorrow is the feast of Modena’s principal patron, St Geminianus, whose relics are kept in the crypt, so I will post some photos of the interior then. God rebukes Adam and Eve; He expels them from the garden; Adam and Eve begin to work the earth. Lamech kills Cain; Noah’s Ark; Noah and his sons leave the ark. Some of our readers will have no doubt heard of The Dorchester Review here on NLM and elsewhere. 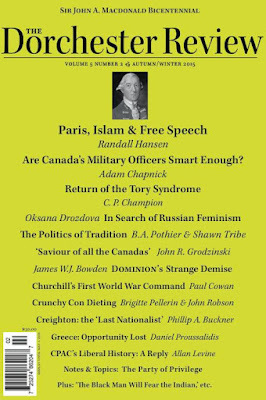 For those who haven’t, it is a bi-annual, small-c conservative journal coming from Canada which focuses on history, politics, arts and culture, Western civilization and more. A good sense of that journal’s focus and sympathies can be found in its manifesto, which, among other things, makes reference to Hilaire Belloc and comments that the review “is founded on the belief that leisure is the basis of culture” (an obvious reference to German Catholic philosopher, Josef Pieper, whose most well known work is an essay by the same name). 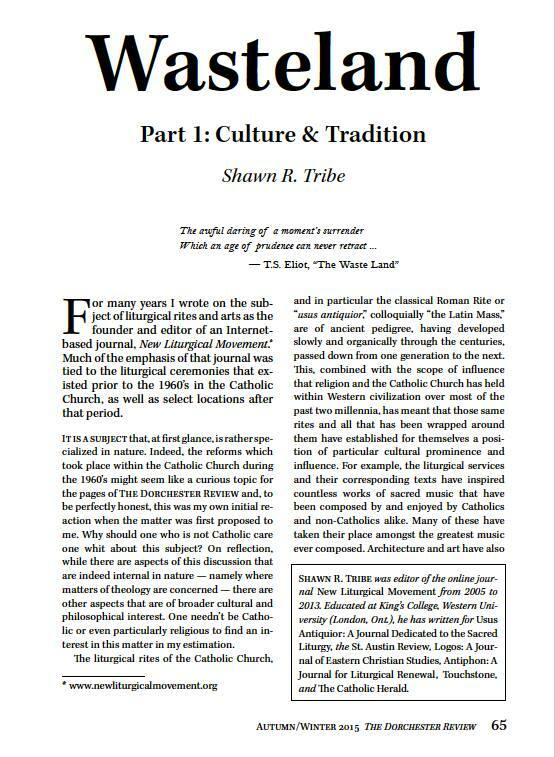 In the current Fall/Winter issue, NLM readers will be interested to know that our founder and former editor, Shawn Tribe, has contributed an article on the matter of the politics of tradition. 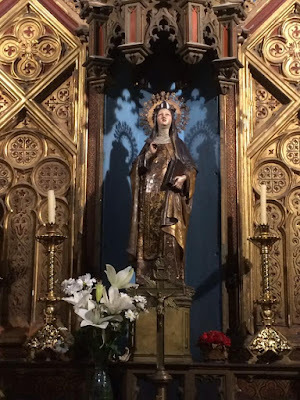 It is a two part piece, the second part of which is written by Bernard Pothier, author of a history of the FSSP parish in Ottawa, St. Clement’s. 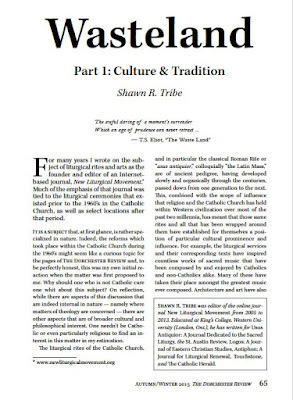 In the first part, Shawn aproaches the question of the importance of the liturgical tradition of the church as part of a broader discussion of why this tradition should matter to Catholics and non-Catholic alike. To accomplish this, the Catholic liturgical tradition is looked at from a Burkean perspective on the one hand and and as a cultural and artistic treasure of Western civilization on the other. 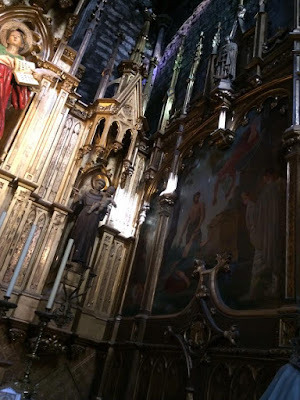 In the second part of the piece, Bernard Pothier gives his first hand account of the liturgical reforms as they occurred within the context of Catholic Quebec, setting the scene for what happened before, during and after. NLM is pleased to be able to bring our readers a preview of this piece. Those who are interested in reading it in its entirety, as well as the other articles in this excellent journal, may wish to consider purchasing a copy of it here. (Click the images to enlarge and read.) You can also follow Shawn on Facebook and Twitter. ... The pursuit of beauty, truth, and goodness is not a universal aspiration today. Perhaps little appreciated is a form of religious worship that in the past inspired great art, music, and architecture: the traditional Mass of the Roman Church, the subject of Shawn Tribe and Bernard Pothier’s essays under the title “Wasteland” (p. 65). It is small wonder that a group of the most distinguished secular liberals living in 1971 appealed to Pope Paul VI not to allow this rite, as a treasure belonging to “universal culture,” to be destroyed (p. 69). Once again, it is very heartening to hear from churches which are making a real effort to celebrate the liturgy of a great feast day with high-quality sacred music from the great Catholic tradition. Here are notices for those in the areas of Philadelphia, Pennsylvania, Jersey City, New Jersey, and Grand Rapids, Michican. Music by Palestrina, Josquin des Prez and Arcadelt. 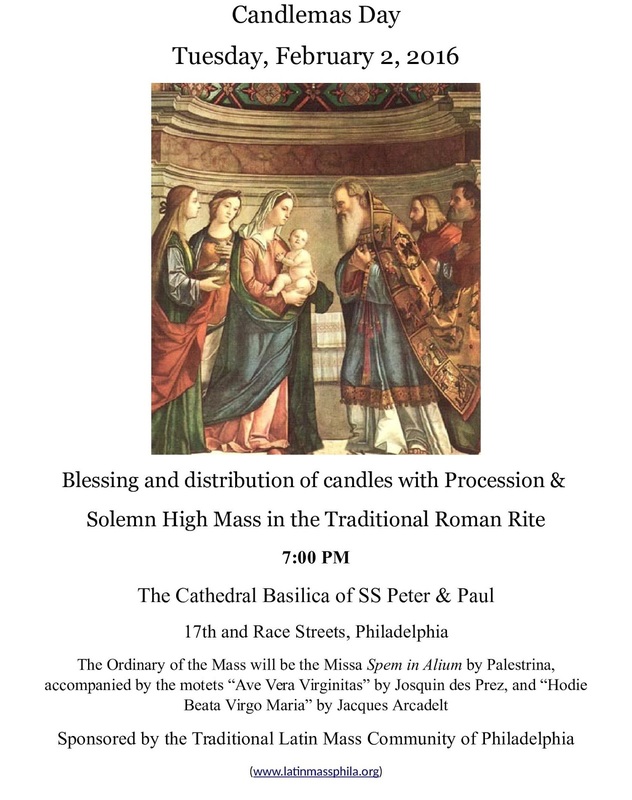 Palestrina’s Missa Brevis will be performed for Candlemas on Tuesday, February 2nd at a Traditional Latin Solemn High Mass in downtown Jersey City’s historic St. Anthony’s Church, starting at 7:00 PM. The church is located at Monmouth St. between 6th and 7th. The church parking lot is located on 6th St. between Coles and Monmouth Street, and is easily accessible from the Grove Street PATH, the Newport PATH and Light Rail stop. The renowned Cantantes in Cordibus choir, directed by Maestro Simone Ferraresi, the noted composer, pianist and conductor, will sing the Mass. Maestro Ferraresi studied at the Conservatory of Music in Ferrara, Italy where he earned his degree with highest honors; at the Academy of Music and Performing Arts in Vienna he studied with world renowned pianist and musicologist Paul Badura-Skoda. He specialized in the interpretation of classical composers; at the Royal Academy of Music in London, he was awarded the Diploma of the Royal Academy of Music – the highest examinable award given, and three special prizes for best performance in the final recital. A social event for young adults will follow the Mass, since a strong drive behind St. Anthony’s performance of this classical sacred masterpiece is the presence of many young parishioners who have recently joined the growing parish in a quickly gentrifyng city. 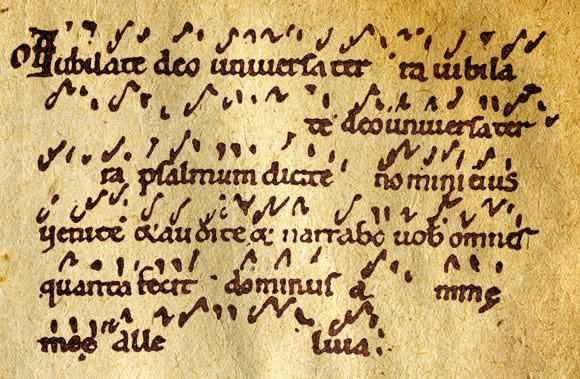 This past Tuesday, Bishop John Doerfler of the Diocese of Marquette, Michigan, issued a pastoral instruction Sing to the Lord, All the Earth, which would initiate bold and sweeping reforms to liturgical music throughout his diocese. All parishes and schools will learn to sing the Ordinary at masses according to the 2010 ICEL Setting in English and the Jubilate Deo Latin setting. Parishes will sing the Communion antiphon proper, even if sung simply, at all Sunday masses. A diocesan hymnal, to be released in Advent 2017, will replace all parish hymnals. No new hymnals may be purchased. Bishop Doerfler references the letter Rejoice in the Lord Always written by his predecessor, Bishop Alexander Sample (now Archbishop in Portland, Oregon). Rejoice in the Lord Always is, in my opinion, the best summary of the liturgical and musical goals of the Church, in context of our sacred music tradition and the norms of Vatican II. There's a lot of practical common sense, a lot of orthodoxy, and a lot of wisdom in Rejoice in the Lord Always, and I strongly suggest reading it. Where Bishop Sample outlined the ideals, now Bishop Doerfler is the executive. Instead of talking about things in the abstract, he is putting them into practice. It is a bold move, and I wish the Diocese of Marquette well. I would be thrilled if a similar project were under way in my part of the country, and I would be the first in my diocese to sign up to help. As an educator, I can only hope that considerable time, expertise, and resources are being invested in this project. When the goals are high and the timeline is short, the possibility of failure is real. All it would take is chant written in keys too high, lack of proper education in parishes on how to do chant effectively (at a quick pace, please), inadequate time to get copyright permissions (hymnal publishers may not look kindly on the project, which cuts into their business), and lack of "buy-in" from key parishes and constituencies. Chant can die the death quickly from seemingly insignificant things, too, like a pastor singing too loudly on his mic. There's a minefield ahead, but I commend Bishop Doerfler for his courage. When it comes to doing chant, we should not live in fear. We should do it, and learn how to do it by doing it. Left to right, bottom to top. Dot means double, squiggle means "wait, then go." Solfege down from DO, and then go. There's no other way. If it feels slow, make it faster. If it feels too high, set it lower. Do what you need to do to make it successful, but nonetheless, do the chant and do it well. Don't wait until your Schola sounds like Solesmes. Not to mention, organ accompaniment helps for Ordinaries. Add nuance and sweetness to your interpretation after you have achieved confidence. I trust that Bishop Doerfler has already recruited a qualified staff for this project. I hope you will join me in praying that the work is received positively. High quality work, coupled together with EDUCATION in our parishes, is the only way to success. Pius X and Justine Ward knew this. Time has come to teach parishes not just to sing their prayers, but also to love our faith. This initiative is a bold step in a good direction. Let's hope and pray it's carried through to a glorious completion. Meanwhile, if you know how to teach chant and good sacred music, please get to work... there may be new jobs in Michigan! There is something oddly fascinating about the shadowy Visigothic Kingdom that ruled Spain before the Muslim conquest. The Catholic Monarchs Ferdinand and Isabella were lauded in courtly song as the descendants of los Visigodos, and my maternal grandmother's family claimed a Visigothic bloodline of its own which may or may not be supported by facts. The only portrait I have ever seen of Grand Admiral Ruy Pérez (b. 642, fl. 680, one of about a million people in the family tree named Rodrigo or Ruy; family tradition insists there be at least one kicking around at all times) is an eighteenth-century engraving that fits him out with a rather unlikely full-bottomed wig and Bourbon court dress and turns the landscape around his humble watchtower at Villanañe into the gardens of Versailles. 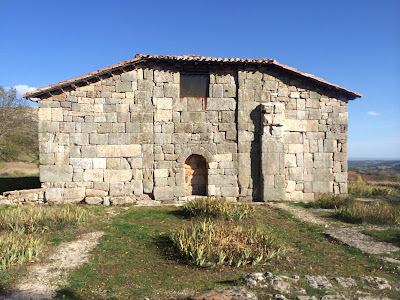 Nonetheless, such is the mystery and power behind these lost lords of Spain that when I was traveling two years ago in northern Castille, we of course had to put in a stop at one of the last remaining relics of that era, the small hermitage chapel of Santa María de Lara. 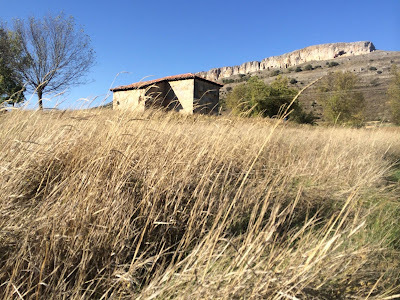 It was off the main road, and further off past the tiny village of Quintanilla de las Viñas, which I remember as little more than a knot of houses and for-sale signs amid rolling hills and high grass. The custodian, a fellow leaning on his motorbike, met us, though we only had about ten minutes as he had to get back to his girlfriend in town. 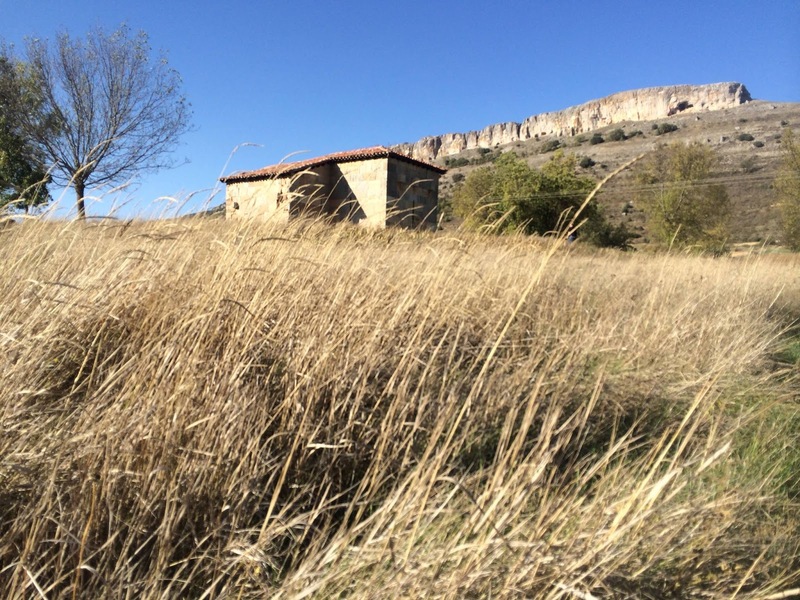 The church stands on a little scrubby upland, beneath a much higher, more forbidding wall of bluffs. Its exact date is unknown, though it may be as old as the seventh century or as recent as the tenth, though the older date seems the most credible. 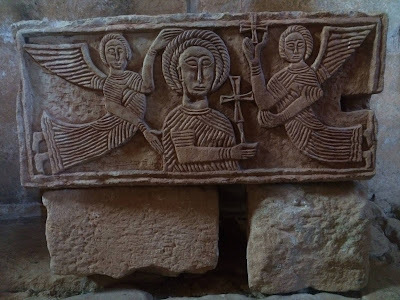 A funeral stele now preserved at Burgos indicates it was rebuilt in the early 900s, after the settlement had been abandoned in the first flush of Moorish rule. A "Lady Flammola" was associated with a restoration around the same time, while the mother of Count Fernán González of Castile gave a donation to the church some decadeslater. It was later ceded to a local monastery, where, after serving as a hermitage, it fell into disuse. 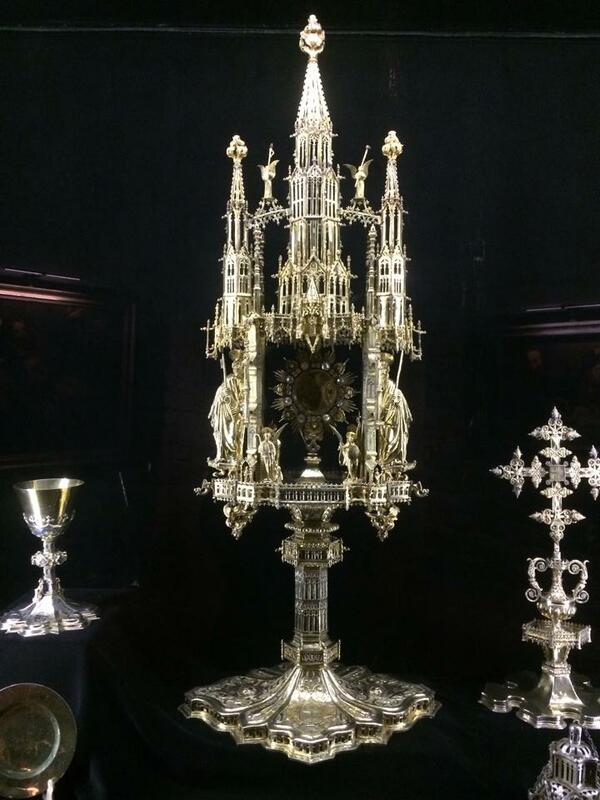 It was only rediscovered in the twentieth century, by a local priest, Don Bonifacio Zamora. It was once cruciform, though all that is left of it is the transept and apse; from the exterior, it is humble, almost comically tumbledown, and its only remaining ornamentation are bands of grapes and vines in low relief. Within, very little remains. Imposts on the large horseshoe arch framing the apse--a Visigothic, not Moorish, feature here--depict allegorical figures of the sun and the moon, rather as in old paintings of the crucifixion. There is little remaining figural art, though a small altar or plinth, now displayed to one side of the apse, shows what might be the earliest image of Christ in Spanish art, an odd, unsettling and almost unrecognizable bit of sculpture. Which brings me to why I felt this was worth sharing here at the New Liturgical Movement--something about the interior, about those cold and otherworldly and even troubling images, seemed completely other. Frightening, no; eerie, yes. The whole chapel, what is left of it, seems marked by an engaging otherness; as someone who often feels quite at home in the past, it was a sentiment I had seldom ever felt, even when confronted with cave paintings. I can't account for it--perhaps it is just the barbarian tastes of the Visigoths; it certainly wasn't their long-departed Arianism, as they had renounced that heresy at least a century earlier before the church was probably built. I do not know if it is religious awe, or an overactive imagination, or simply the distance of time, but it seems, like a place in a ghost story or a fairy tale, where anything, for good or ill, could happen. Why I think that those who criticize the Christian artistic tradition for always presenting Christ as a northern European are wrong. I have read a number of articles over the years that criticize the traditional representation of Christ as historically inaccurate and exemplary of historical northern European cultural bias. Twice recently I have heard this discussion sparked off by the discovery of human remains in the Holy Land which date from the time of Christ, which have allowed scientists to create an image of the person from whom the bones came. The figure that is recreated is, surprise, surprise, olive-skinned and Semitic-looking, and so this indicates, so the logic goes, what Christ would probably have looked like. This being so, it demonstrates how narrow minded Europeans are, and how culturally narrow Christianity is for portraying Christ as a white, Caucasian. 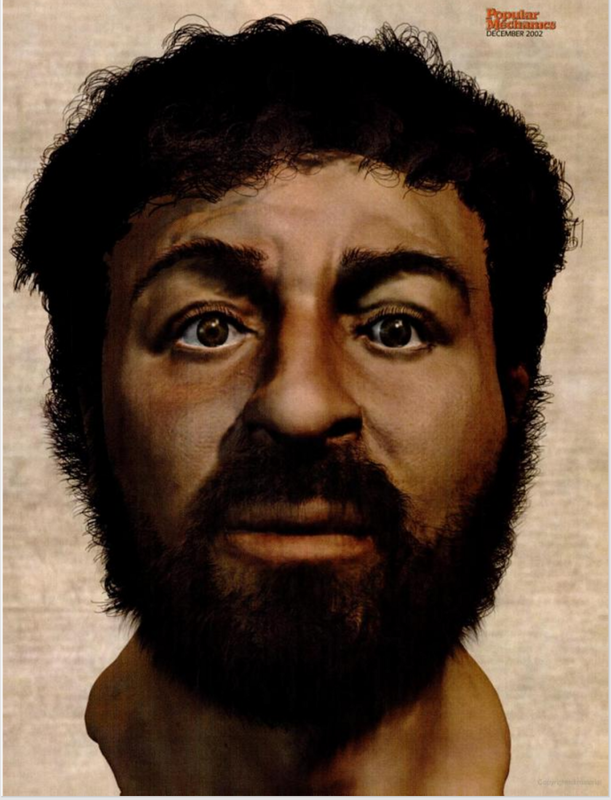 He looked instead more like this scientific reconstruction of a man developed from a skull discovered in the Holy Land, according to this article. Here is my reaction: first, if ever there was a concocted news piece this was one - does we really need the discovery of a skull as evidence that a Jew living in the Middle East about 2,000 years ago might have been dark skinned and Semitic-looking? I think nearly every Christian today would at least be open to the idea without feeling that their faith was threatened, and it wouldn’t require the discovery of a skull to convince them. This desire to portray Christ in a form that the intended viewers will relate to can manifest itself in other ways. 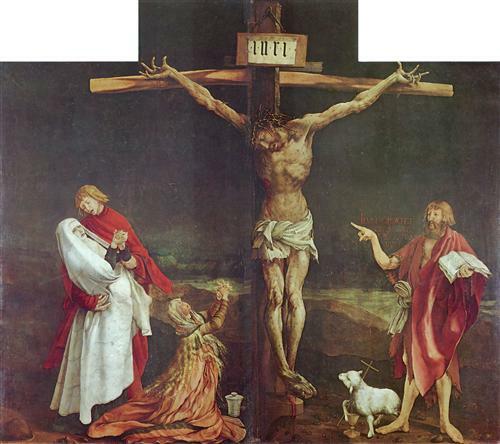 This famous crucifixion by Grunewald shows Christ with the open sores of a fungal infection transmitted through rye grain eaten in the bread of 16th century France. Those who suffered from this horrible disfiguring disease were given care in a hospital, and this painting was painted for chapel in the hospital. The intention was to give them solace by showing that Christ not only bore the pain of their sins, but was suffering with them physically too. 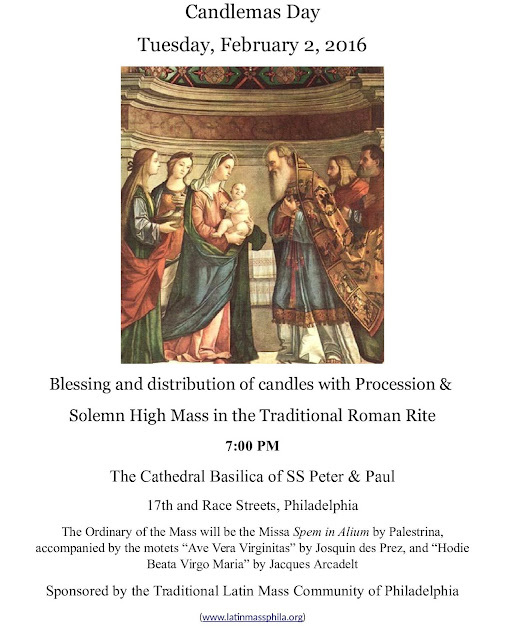 For the feast of the Presentation of the Lord in the Temple and the Purification of Mary, Tuesday, February 2, the St. Ann Choir will sing medieval English Mass music as well as the Gregorian chants for the procession and Mass. 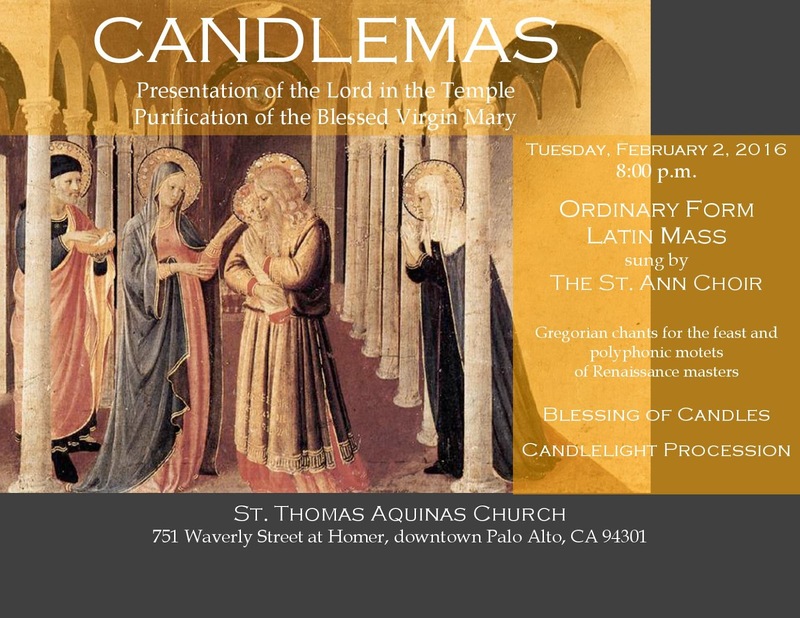 The blessing of candles and candlelight procession, followed by Mass sung in Latin Mass, will take place at St. Thomas Aquinas Church, 451 Waverly (at Homer) in Palo Alto, starting at 8:00 p.m. In today’s world, we’re always losing things. Products like “Tile” and “find my iPhone” and GPS help us locate things or people we’ve lost. In our time, we also seem to have lost sight of the sacred. Fr. Uwe Michael Lang’s new book Signs of the Holy One, published by Ignatius Press, offers a map and directions for how to find the sacred. And rightfully, Fr. 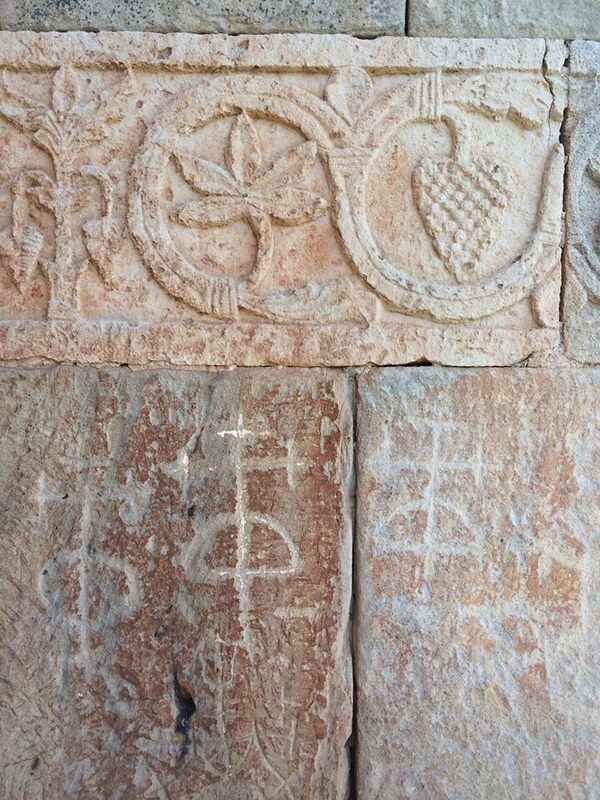 Lang locates the sacred in the signs and symbols of the liturgy, especially when done well. I will be writing a review of Fr. Lang’s Signs of the Holy One in three parts. This first part will deal with Fr. Lang’s assessment of the 20th century theological background. Let me begin by recommending this book highly to all of you in the NLM readership. Let me also comment that I am neither an academic nor a theologian by trade; I am a Catholic, a husband, an educator, an organist, and a choral director. My comments below are unrefined and unscholarly, but Fr. Lang's book is both refined and scholarly. Read at will. The theological pitfalls of the 20th and now 21st century loom large, and have had profound implications for liturgy, sacred art and sacred music. Fr. Lang articulately examines how theological writings by Edward Schillebeeckx and Karl Rahner in particular have profoundly confused Catholics in a way that, for some, has called into question the very foundations of our faith and sacred tradition. Drawing on a wide variety of sources, Fr. Lang examines all the opinions and considers each one carefully, before knocking a home run for orthodoxy and the traditions we know and love. But let's get back to Karl Rahner for a bit. Having been raised in a devout, Bible-reading Evangelical family, and having grown up in one of the poorest neighborhoods in Rochester, NY (which is itself the fifth poorest city in the United States), I personally never thought much of Rahner. It’s easy for one to affirm the natural human virtues of the comfortable classes in warm climates, to praise the natural human freedom of those who don’t have crushing addictions and poverty, to side with those institutions and communities which have been consistently successful, to rest on the laurels of Western culture at peace and in good health. It's easier to fall asleep at night, if all paths are somehow comfortably on God's map and lead everyone home. It’s convenient to ignore St. Augustine and the long tradition of Church Fathers, who remind us that conversion requires hard work on our part and supernatural grace to overcome original and actual sin. Baptism (sanctification) and perseverance are two separate graces, and conversion is certainly not automatic. In any event, Rahner’s theology was a middle class luxury we couldn’t afford in my home community, where people needed God’s help and a strong church community to overcome herculean personal and practical challenges. For us, becoming holy meant making the right moral decisions, decisions which “set one apart” from the decay and collapse all around. Becoming holy meant trusting God for safety, provision, and strength. 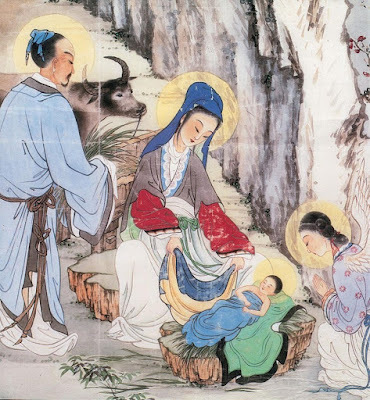 After gaining strength, being holy also meant returning to the streets, but this time as a servant and a witness of faith, even if we could only do a little bit to help. After all, it was the widow’s mite given in her need, not the petty cash of the wealthy given in their abundance, which was pleasing to God (Luke 21). None of this was a personal commentary on any one person's natural, God given beauty or abilities. 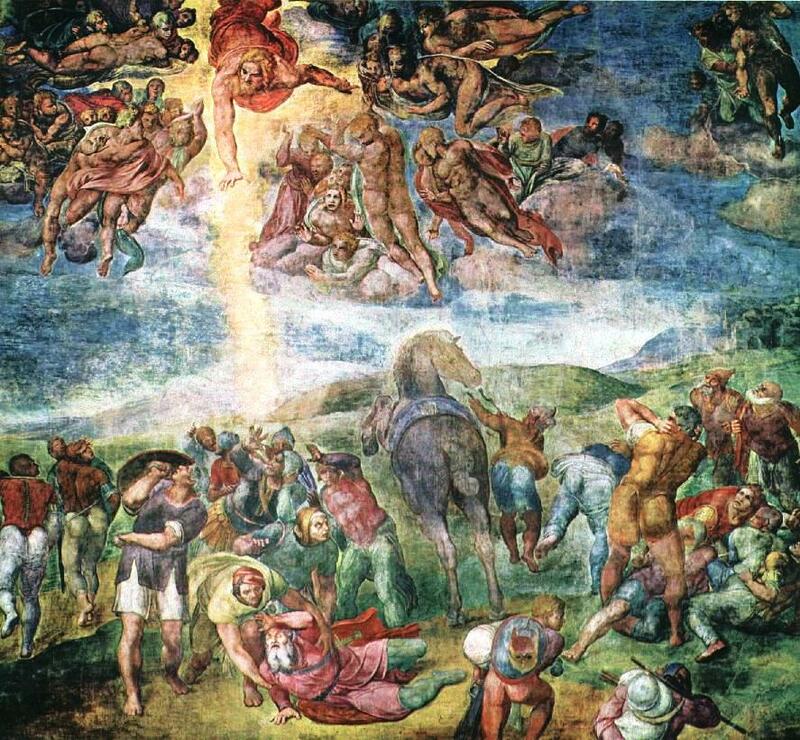 It was a realization, as St. Paul wrote, that "all have sinned and fallen short of the glory of God..." (Romans 3) and me, first! Conversion, renewal, and holiness start must with me. The liturgy -- at least the Eucharistic part -- made sense only when one had already undergone some sort of conversion, through both baptism and ongoing personal commitment. "Blessed are the pure of heart, for they shall see God." The vision of God depends on the purity of heart. Rahner’s theological problem, to put it simply, is the “sanctification” of the unredeemed. Instead of holiness being a result of sacramental grace, conversion, Christian service, and prayer, Rahner saw grace and holiness being infused into the natural order by virtue of Christ’s Incarnation, operating all around whether people participated in it willingly or not. Apart from the mistake of mowing down two thousand years of important distinctions, it is a dumb mistake to call something holy which hasn’t been made holy yet. It’s a participation trophy, given out to some folks who aren’t playing well, or even to others who are driving by outside and don't even know there is a game. Rahner made exactly this mistake, by thinking salvation is something which flows categorically and indiscriminately as a result of the Incarnation. By logical extension, Rahnerians can slip into a quiet universalism. In other words, if everything is already made holy through Christ’s Incarnation, why bother with conversion? As Fr. Lang points out, the problem with Rahner’s understanding is that we lose sight of the sacred, and as a result, we can’t find God, who is the source of holiness. Losing sight of what is sacred is all well and great when you don’t need God, but it’s a terrible problem when you do. For Catholics, it’s a crisis. Not only has our membership shrunk dramatically in the West, we often can no longer articulate any real or convincing personal reasons for attending Church. Unchurched family and friends come to Church to seek redemption and grace as solutions for real and personal problems (like addictions, crushing sins, loneliness, conflicts, poverty, etc) but, following a Rahnerian understanding, they are told that Christ has already healed them and they simply have to “start living” that redemption. Or we offer a phone call to the local Social Services office. I do not mean to be flippant, but we’re offering no help, and we wonder why people stop coming. 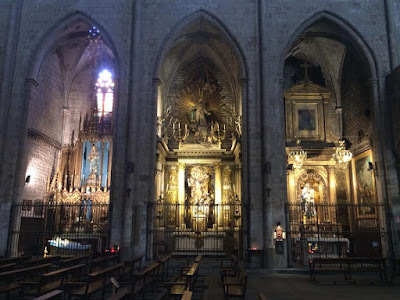 Holy living, being set apart for a higher purpose, and making a connection with transcendent truth, goodness, and beauty: these are the fruits of good ritual and liturgy. Fr. Lang is much more of a gentleman and scholar than I, and he has touched the root of the problem. As you can tell, I found a lot to savor in Fr. Lang's scholarly critique of Karl Rahner and Edward Schillebeeckx. He was able to carefully extract the small bits of truth from their writings, while avoiding the massive amount of slop and confusion. In the following chapters of Signs of the Holy One, Fr. Lang discusses how Sacred Art, Architecture, and Music, the theological “muses,” have been negatively affected by the theological confusion of the 20th Century. He further offers some suggestions and principles to get us back on track. Look for Part II and III in the coming weeks, and meanwhile, get yourself a copy of this excellent book! You will not regret it. There is also a second film in the same vein, from a year later, which covers many different aspects of the life of these communities. 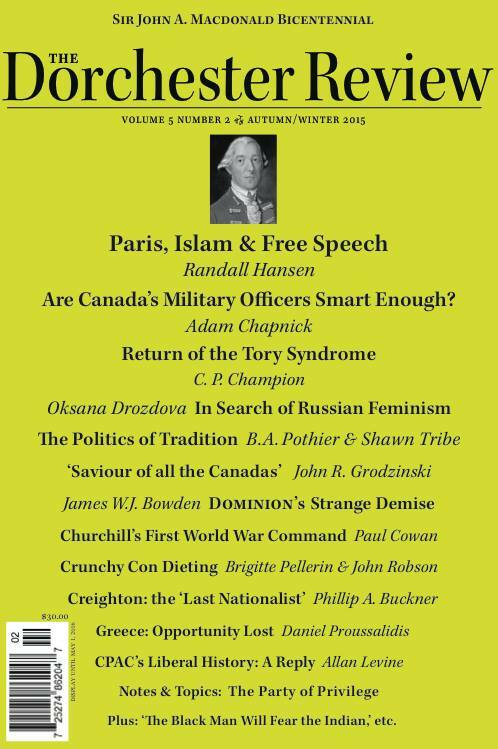 The first half is about pioneer life and farming, but starting from about 6:50, it talks about the various religious institutions founded by the Ukrainians in Canada. The January Edition of the Adoremus Bulletin is Now Out. The latest Adoremus Bulletin is now out and can be read online immediately. This is a particularly varied and strong issue. 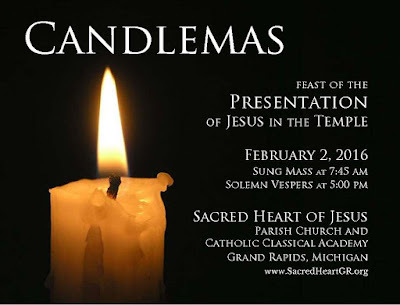 Even the presentation of simple news events is made through the prism of the liturgy in interesting and informative ways. Two articles caught my eye. 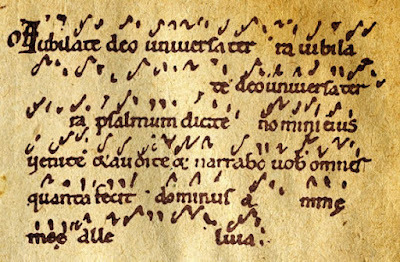 The first, by Christopher Carstens, is a discussion of the proper form of language in the liturgy, with a particular reference to the poetic device of repetition. The second, in the light of the introduction of Holy Doors in our cathedrals, was a clear and simple explanation of indulgences. I admit that indulgences have been peripheral to the practice of my faith up until now, something I had never really thought about in depth. 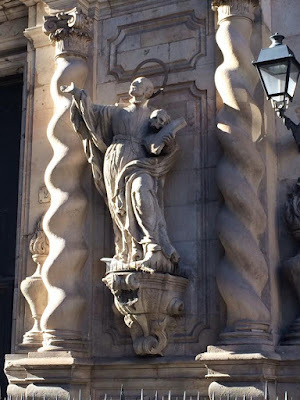 Each time I heard a priest telling us that if we did something we would be given a “plenary indulgence,” I made a mental note to try again to make the effort to understand what this was about...only to forget about it until the next time I heard the word. You can read the whole issue online here. A few selected images from my visit in 2014 that may be of interest. In Sacrosanctum Concilium, the Second Vatican Council decreed the reform of the liturgical books. But how well did that reform actually follow the mandates of the council? As someone who attends the Extraordinary Form in a diocesan parish which celebrates both forms of the Roman Rite with dignity and reverence, I do not intend to discuss here the ars celebrandi in which the Ordinary Form is celebrated, but only the content of the texts and rubrics themselves. Nor is this intended to be a critique of the lectionary itself, which is also another discussion for another time. 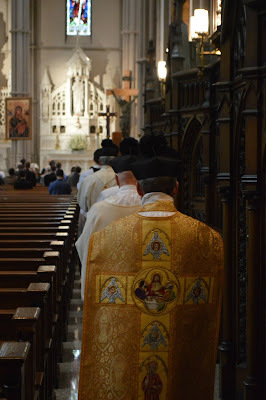 I do believe the Conciliar Fathers had a significant part to play in the bad practices that developed after the Council, both through their actions in the celebration of the liturgy and in the texts of the council itself. That, however, is a discussion for another time. Here, I intend to take a closer look primarily at the revised Ordinary of the Mass, the mandates of the Council, and compare them with those elements which have been specifically downplayed or removed in the Ordinary Form of the Roman Rite. While some may see this as a feeble attempt to compare the Extraordinary Form to the Ordinary Form, it’s not simply that. Sacrosanctum Concilium asked for a revision of the missal, not a complete rewrite from scratch. Therefore, any discussions of the reforms and formation of the Ordinary Form liturgical books must be placed in context of the 1962 Missale Romanum, as that is where they were reforming from. To ignore it is to not fully appreciate the situation. I am well aware that those who disagree with me will be quick to quote Sacrosanctum Concilium § 51. On this topic I will limit myself to the following observations and questions: what makes a part of the rite “of little advantage?” For the purposes of this post, how should § 51 be implemented in such a way so as to not directly conflict with § 24, § 25.1, § 51, and § 91? 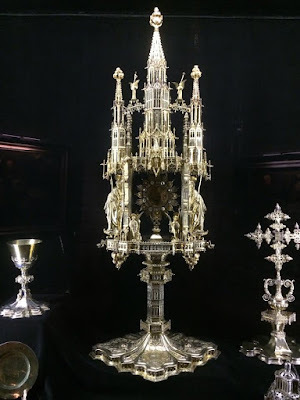 (See below) Indeed, I am writing this post from the point of view that the council documents contained the best vision for liturgical reform, and am intentionally leaving the post open ended on that topic, with a view to further reflection on its value. The discussion about the merit of Sacrosanctum Concilium itself is an important one, but again, will be left for another post at a later date. First, I begin with the Asperges. In the Extraordinary Form, the Sunday Mass begins with the sprinkling of blessed water, accompanied normally by an antiphon from Psalm 50 (51 - Asperges Me) and accompanying verse or Ezechiel 47 (Vidi Aquam) and a verse of Psalm 117 (118). These are sung before the High Mass every Sunday, as a required part of the rite. In the Ordinary Form, this chant and ritual is downplayed (according to GIRM § 51) to be used “from time to time,” and also replaces the Kyrie and Confiteor. In the Extraordinary Form, Psalm 42 (43) is recited by the priest and sacred ministers or servers at nearly every Mass, barring Requiems. Notably, in the Ordinary Form, this is completely removed, and the Mass simply begins at the Introit, giving the beginning of Mass a very different flow. Also, we find that in the older form, as the priest washed his hands near the end of the offertory, he would read 7 verses of Psalm 25 (26), which talks about being cleansed of our sins and praying at the altar of the Lord, followed by a Gloria Patri. In the Ordinary Form, this is replaced by a single verse from Psalm 50 (51) during the the same action, with no Gloria Patri. Next, in the Extraordinary Form, we find another big change to the flow of the end of Mass, where the first fourteen verses of the Gospel of John are proclaimed at the end of almost every Mass, a practice going back to the twelfth century. If you’re following the trend of this post, you may have guessed that this was also removed from the post-Conciliar liturgy. The exclusion of this one is perhaps the most incongruent to me, as this Gospel not only speaks of the nature of Christ in the didactic matter the Council encourages, but of course is a removal of scripture that was mandated to be in more abundance and more suitable. If the reformed liturgy is to be more easily understandable and didactic, why would one remove the recurring passage which describes briefly the nature of Christ and his mission? And finally, the proper antiphons of the Mass are required to be prayed by the celebrant at every Mass, and are required to be sung at every Mass in the Extraordinary Form. This is also a discussion for another post, but in the Ordinary Form, in Masses without music, the offertory proper is missing, and in sung Masses, they are merely one option among many, with only a slight preference toward the proper chants over various motets and hymns. In conclusion, I ask the same question I posed above: how well does the implementation of Sacrosanctum Concilium follow the mandates of § 24, § 25.1, § 51, and § 91? 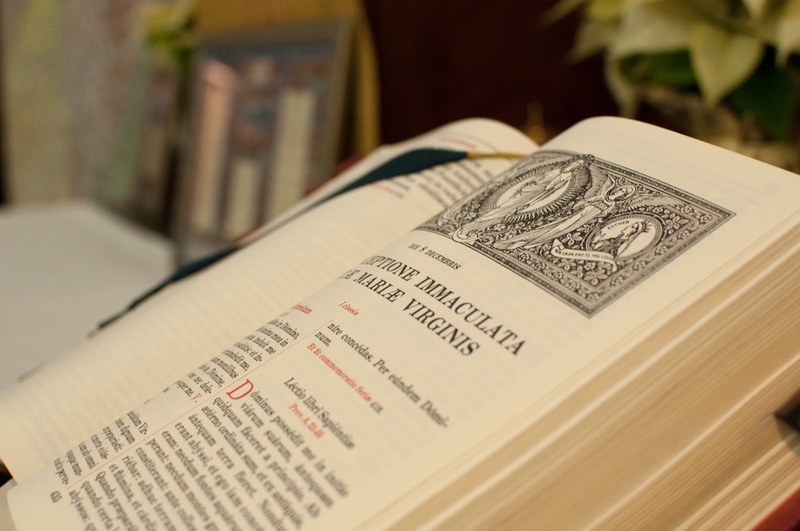 § 24: Sacred scripture is of the greatest importance in the celebration of the liturgy. For it is from scripture that lessons are read and explained in the homily, and psalms are sung; the prayers, collects, and liturgical songs are scriptural in their inspiration and their force, and it is from the scriptures that actions and signs derive their meaning. Thus to achieve the restoration, progress, and adaptation of the sacred liturgy, it is essential to promote that warm and living love for scripture to which the venerable tradition of both eastern and western rites gives testimony. § 35.1: In sacred celebrations there is to be more reading from holy scripture, and it is to be more varied and suitable. § 51: The treasures of the bible are to be opened up more lavishly, so that richer fare may be provided for the faithful at the table of God's word. § 92: Readings from sacred scripture shall be arranged so that the riches of God's word may be easily accessible in more abundant measure. 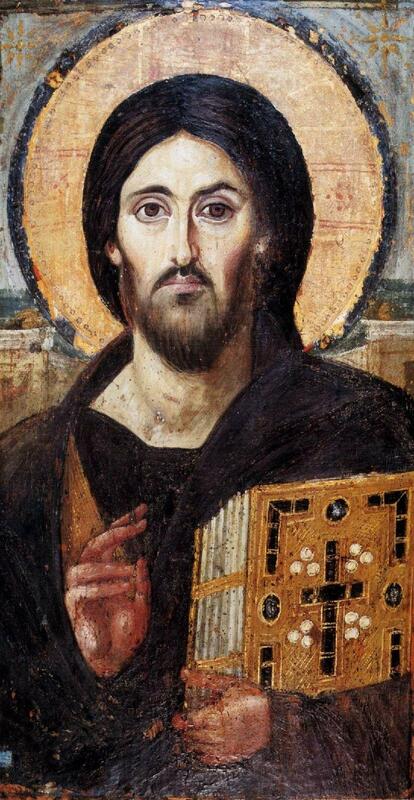 Documentary About the Original Divine Mercy Image - Is This Really What Christ Looked Like? 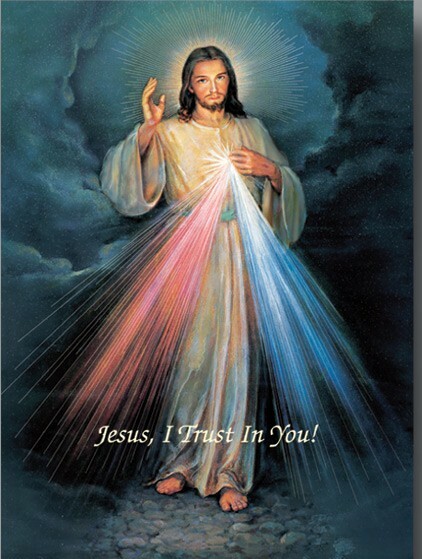 One of the most familiar images in Catholic churches today is the Divine Mercy image. Most will be aware of the story of the vision of Sr Faustina and how she instructed an artist in Lithuania to paint it. What I did not know is that the images that we see most commonly in churches, and which are usually reproductions, are not reproductions of the original, but of painted copies of the original. You can see this in the trailer for the documentary here. I did hear a story that Sr Faustina was never happy with the image either, and in the end, reluctantly agreed to its use assuming that no artist could ever reproduce satisfactorily what she had seen. 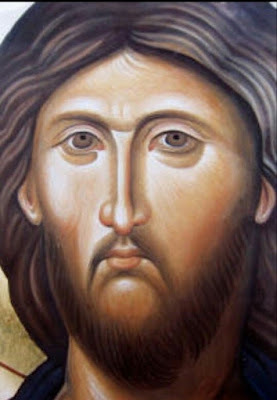 Then years later, so the story went as related to me, she saw an image of Christ painted in the iconographic style and said, “That’s what he looked like!” I can’t corroborate this, but I find it plausible. Putting my personal preferences about the style aside, there is another very interesting point about this image. I am happy to accept that there is at least a basic likeness between the image and what Sr Faustina actually saw in her vision and described to the artist. The Divine Mercy image of Christ corresponds to the classic likeness that we are used to seeing in so many paintings from the tradition. He has a beard and long hair, for example. 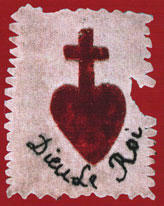 This corresponds also to other images not created by human hands, such as the Shroud of Turin and the Mandylion. 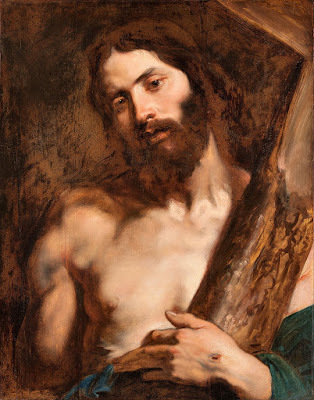 Is this what Christ looked like historically? The skeptic would say that the Divine Mercy image looks as it does because Sr Faustina’s vision came from her imagination, which had been influenced by images that she had already seen; and that it was not a vision direct from God at all. The criticisms from the politically correct who are interested in cultural diversity would take the same line, and then go further. They would say that the whole tradition is influenced by a Eurocentric vision of the world that makes him a white Western European in flat contradiction to what history tells us about him. 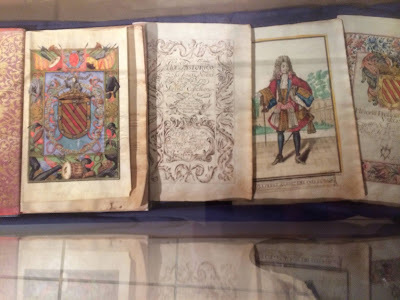 Back in December, I posted a short review of a new book from Angelico Press, Roger Buck’s The Gentle Traditionalist. (Have a look at that review if you are interested in a more general description of the book.) At the time, I promised to follow up later on with a few specifically liturgical thoughts. As the story continues, Geoffrey (GPL) meets a mysterious character called the Gentle Traditionalist. GPL: It is indeed odd to find you here. In fact, I’ve been wanting someone to help me understand the exact issues you describe: those which separate modern, liberal people, as you call them, from conservatives. I’ve met this conservative type — a woman. Really, I cannot understand half the things she’s talking about. GT: Yes — your culture never provided you the means to understand. This phrase has haunted me ever since I read it: some people have been culturally denied the keys to understanding the Faith and its traditional practices. This is not to say that unbelievers have no personal responsibility, that all can be blamed on the surrounding culture. It is but a sobering acknowledgment that so many people, even within the Church, have never been given the basic “means to understand” what she is talking about in her doctrine, what she is doing in her rites. Very few (comparatively speaking) are deeply, intimately familiar with the teaching, life, and rituals of the Church in their preconciliar fullness and clarity. This is why reading older authors for the first time can bring us up short: “I cannot understand half the things she’s talking about … her views are completely unintelligible.” We see the dynamics of rupture and discontinuity at work. GT: Well, the 1960s are just a handy approximation. Although some people are even more specific than that. They identify 1968 as the turning point. 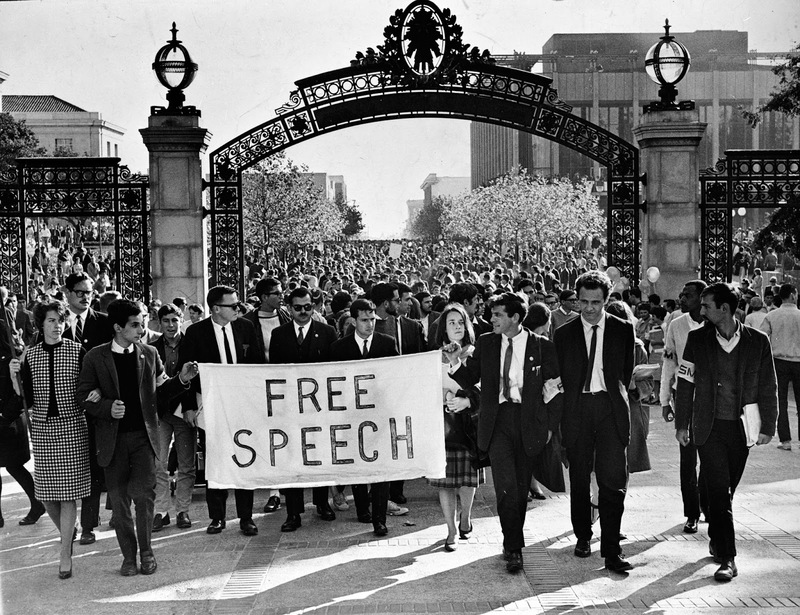 But think about what I’m saying: Wherever previous generations disagree with the post-1960s worldview — let’s call it that for short — previous generations are always wrong. Post-’60s is always right. At least, according to modern media and education. Post-’60s says a woman has a so-called “right to choose.” Post-’60s must be right; everyone who felt differently, before the ’60s, is obviously wrong. Although at this juncture in the story the characters are talking about the wider problem of the modern creed of secular relativism, the observation here is strikingly applicable to the liturgical question. 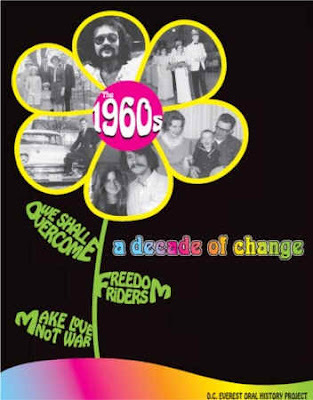 The 1960s marked a turning point, a watershed moment. 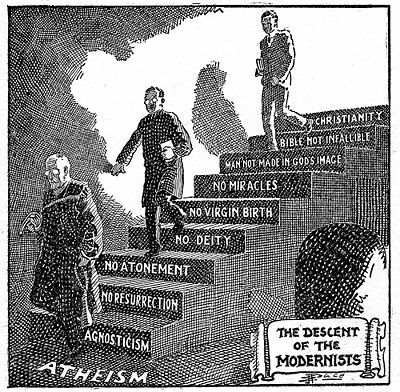 Although there were liturgical modernists well before that decade, it was only then that the above-described mentality firmly entrenched itself — namely, that whatever in the realm of liturgy was said and done and believed before the 1960s is always wrong and that what is being said and done and believed now is always right. Everyone who felt or thought (or feels or thinks) differently is wrong: they are stuck in the past, they have not caught up with modernity and its new insights and requirements. Prior to the 1960s, there was a long line of Popes who spoke with great determination and seriousness about the normativity of Catholic tradition, the immense respect due to it, and the danger of innovation and experimentation. During and after the 1960s, tradition had become a bad word, respect for it a sign of spiritual regression or mental feebleness. Proponents of liturgical revolution were able to prevail based on a fundamental premise that was never allowed to be challenged. As many have noted, Catholics today, due to a powerful desire to accommodate themselves to the secular world, to be welcomed by it and “competitive” with it, run the serious risk of imbibing the materialist metaphysic, the New Secular Religion, and even reproducing and reinforcing it in and through their corporate acts. Sadly, we cannot exclude the causal influence of a worship that no longer confronts them with and immerses them in otherworldliness, the primacy of the invisible, inaudible, transcendent, as underlined by rich symbols of the sacred, hallowed chant, hidden ritual, and reservoirs of silence. If most Catholics in the contemporary West have the mentality of secular materalists, must we not resolutely and fearlessly look to the root causes of this debacle, and not be content with a superficial prognosis? [T]he English often have the whole idea of the Church mixed-up. You think it’s a place where someone preaches a sermon, you sing some hymns, maybe say a prayer or two. Then come home again. For Catholics, that’s a travesty of the Church! I warned you this wouldn’t be PC — but it’s the tragedy of the English-speaking world. Millions and millions of English people — also Americans, Australians, etc. — they all think a church is somewhere you gather on Sundays for spiritual instruction. Rules! … The Reformation never took hold in most countries like it did in England. So this state of confusion doesn’t exist in Greece or Russia or Spain. Plus, in some countries, they use separate words for Protestant and Catholic sites of worship. But in English, it’s just one word — church — for two entirely different realities. To your ordinary American, a church is something like a meeting hall — an assembly room! To a Catholic, it’s a place where the most sublime ritual on Earth is enacted. 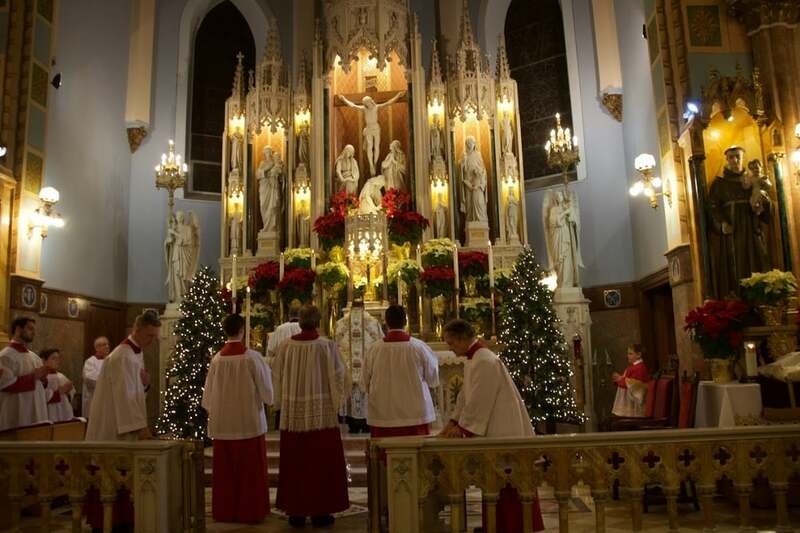 That the Mass itself has been reduced in the minds of many to a community gathering for songs and homilies — as evidenced by the relative emphasis given to each of the parts in many celebrations today — only sharpens the point Buck is making: the Protestant notion of “church” and “church service” has massively invaded the Catholic sphere, to the point where it is almost unknown that the Mass is primarily an oblation of the Body and Blood of Jesus Christ to the glory and praise of the Most Holy Trinity, a propitiatory sacrifice on behalf of the living and the dead, and only secondarily an occasion for instruction and fellowship. One might put it this way: the Mass is pleasing to God and sanctifying for man because of its inherent nature as the unbloody renewal of the all-sufficient sacrifice of Calvary, the fruits of which we share in Holy Communion; its didactic and social functions are premised on that sacrifice, ordered to it, and derived from it. 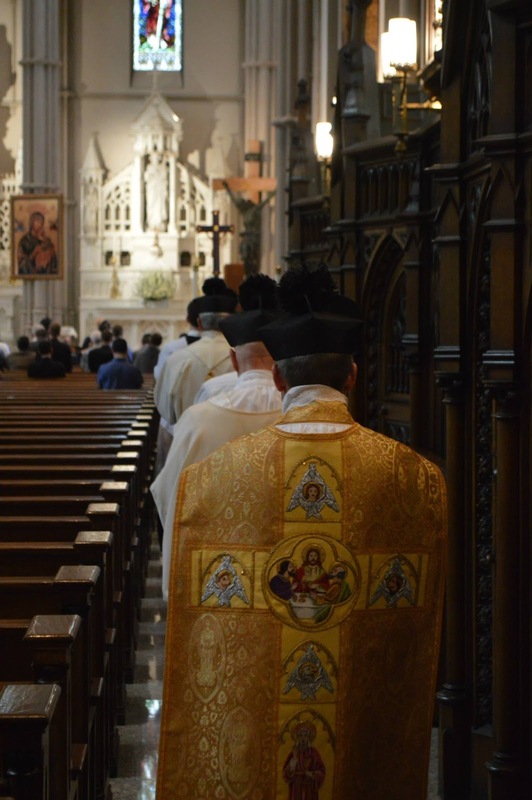 American Catholics are blessed with many priests and bishops who take the sacraments seriously, which might prompt one to think the Gentle Traditionalist guilty of exaggeration. If one looks to the dire European scene (as this book does), however, there is no question of exaggeration. One may indeed wonder if the Son of Man will find any faith left when He returns. Without a doubt, there are still the valiant who cling to the Church, her sacraments, and her sacramentals, but they can see their societies and their churches crumbling around them. In our times, to continue to be supernaturally hopeful and to persevere in the faith despite appearances and a lack of institutional support is a form of heroism that may well produce the great saints of the end times. Exactly: the Church cannot take anything for granted; her earthly leaders must claim her power and use it, rather than being embarrassed or afraid or reticent or too sophisticated. I am reminded in this connection of something often stated and experienced by Juventutem groups: If only the Church’s leaders would bring forth the treasures of tradition with pride, joy, and generosity, spreading them as a banquet before the starving men and women of our profaned world, all would see their immense sanctifying and evangelizing potency. It can already be seen in the places where the “experiment of tradition” has been attempted without any artificial restrictions. These are only a few snippets from the book, which again I recommend for its well-rounded and humorous treatment of the problem of modernity and the necessity of a “counterrevolutionary” response to it. Buck has shown convincingly, in the form of a dialogue of ideas, why a compromise with the anti-natural, anti-traditional, anti-sacramental spirit of modernity is impossible and has been, in fact, the root cause of our present malaise. It comes down to rationalism (the mental disease introduced by an era we would do well to call “the Endarkenment”) or tradition (which bears in itself the true enlightenment brought by Christ). Like water and oil, they can be blended with violence but they do not mix and must eventually separate. Click here for The Gentle Traditionalist's page at Angelico Press. Click here to order from Amazon.com. R. A Christo de caelo vocátus, et in terra prostrátus, ex persecutóre effectus est vas electiónis: et plus ómnibus labórans, multo latius inter omnes verbi gratiam seminávit * atque doctrínam evangélicam sua praedicatióne complévit. V. Inter Apóstolos vocatióne novíssimus, praedicatióne primus, nomen Christi multárum manifestávit gentium pópulis. Atque. 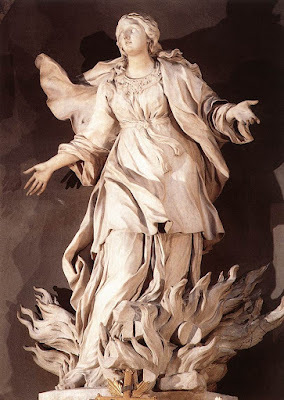 Gloria Patri et Filio, et Spirítui Sancto. Atque.